In a large sauce pan saute garlic in oil until tender. Stir in the remaining ingredients and bring to a boil. Reduce heat to a simmer. Let simmer, uncovered for around 30 minutes, Stirring often. Taste for seasoning, remove from heat and let cool. If you have left over sauce, You can serve it over pasta, or make a pizza. It will keep in the fridge for up to 1 week. Heat the oil before you prepare the zucchini. I use my deep fryer, so it usually takes around 20 minutes to heat up. Cut the ends off of your zucchini, then cut the zucchini in half. Cut the zucchini into fourths length-wise. Do this until you have the desired amount of zucchini fries you wish to make. Mix up your egg replacer and then combine it with your non-dairy milk in a medium bowl. Whisk well. Pour your flour into a shallow dish. 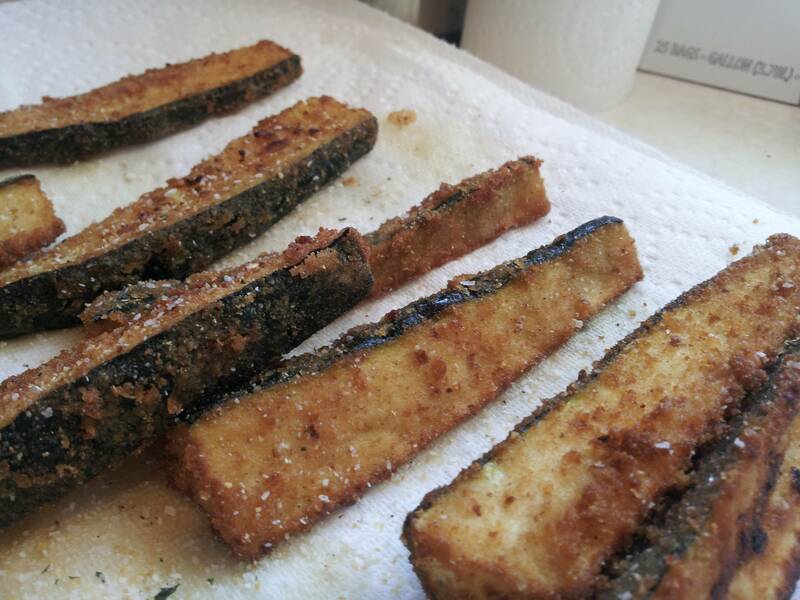 Dip your zucchini fries in the milk, and toss in flour until fully coated. Repeat until the fries are entirely coated. I usually coat them two times for a thicker batter before I fry them, but one coat is fine. Fry, sprinkle with garlic salt and serve with marinara sauce.